In my previous post about how recent Facebook developments can affect SEO, I mentioned that content marketing should always be part of any SEO strategy. In fact, many SEO practitioners, one of which is Brian Dean, share the same sentiment although he presents it using his equation for links. Content marketing is basically the (Great Content + Targeted Outreach) part. But, sometimes, the problem is we limit ourselves to text or written content when we approach content marketing. A study of 500 publishers by Fractl proves this. The study shows a lot of valuable data about what publishers want (there is a Moz article on that). 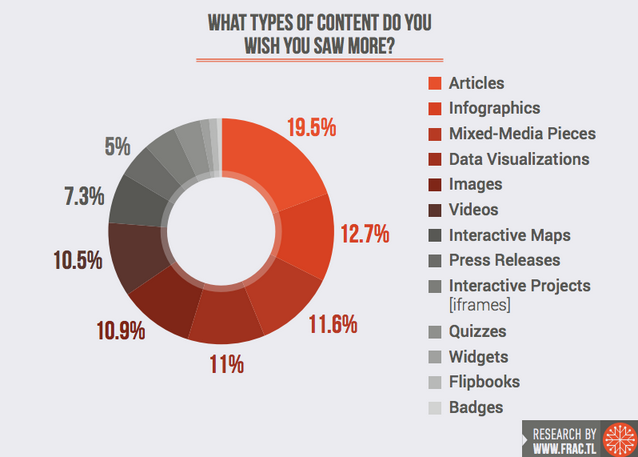 The publisher survey reveals that 19.5% of writers want to see articles. That’s on top of the list, meaning, written content is still leading.